So they have no deal what they want. They try things and see what sticks. 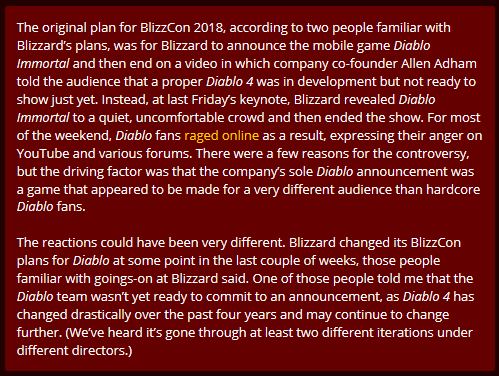 One of the biggest PR disasters of the last decade, and the definitive killing blow for Blizzard. I've said it in the past, multiple times. Fanboys are cancer, not just because they always defend the company no matter what, going as far as to shut down constructive criticism, stagnating the game's growth. That's only the first part, but it becomes worse, because once controversies reach a boiling point (and they will), all those fanboys turn into haters in a single day. 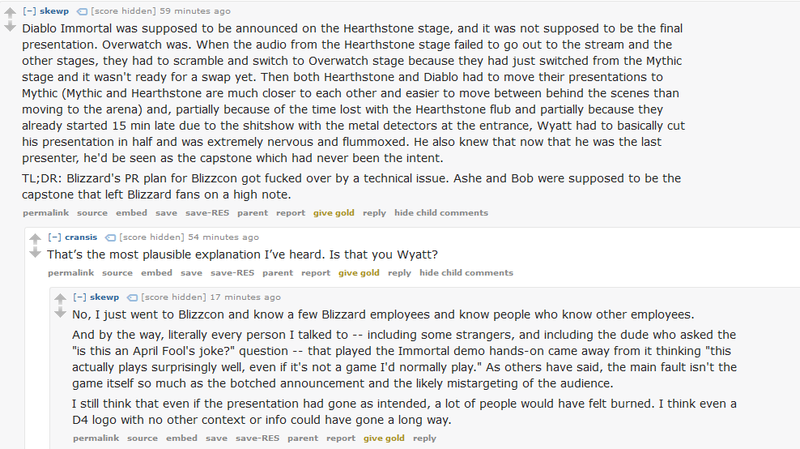 Blizzard hasn't lost multiple fans because of this. Those fans were long gone, and I can personally attest to this, since I was part of the Spanish fansite program and know the post-SC2 and post-D3 apocalypses firsthand. No, what Blizzard has lost are fanboys, and they haven't quite lost them, they've turned into full blown haters, and unlike fans who get bored and leave, they won't until the ship sinks with them. The same zeal they had to defend the company, will now be spent at attacking it. It doesn't help that the garbage videogame journalist are pushing their SJW agenda once more, blaming GamerGate, Trump, and Russian bots for the controversy. Way to polarize the angry fans even more. I swear to god, these idiots are mentally retarded and have learned nothing. The simple truth is, Blizzard died long ago. I'd say WotLK was their red line, with all the stuff they cancelled. It's only gotten worse since. What we saw for these last years, was nothing but a corpse in a stick. And now, the mirage is over, and everyone can see the rotting corpse clearly with their own eyes. Oh, and by the way, "Blizzard dying" doesn't imply bankruptcy or anything like that. They will be around for a long, long time. I mean, look at EA, do they show any signs of going away? Trash is here to stay, and now Blizzard is officially part of the club. Last edited by Lon-ami; 11-06-2018 at 03:38 AM..
Nixxiom is most likely right, that this was a Shareholders Decission. However, he's imo. forgeting something, which I already addressed on Discord. Mobile Games are a big thing in Asia. Heck, League of Legends actually tanked in Japan, because hardly anybody plays PC. But it still is a big gaming market, which is mostly likely also the reason why Diablo III gets adapted for the Switch.